Comfy Oceanside Home. 65%+ of Our Guests Are Repeat Families!! Welcome to our Duck Vacation beach house! We have been so fortunate to have more than 65% of our guests come back year after year. That says a lot!! We pride ourselves in making sure the house is updated and refreshed for each season!! This is not just a 'rental'. We enjoy the house in the off season, so it get's much attention and care. 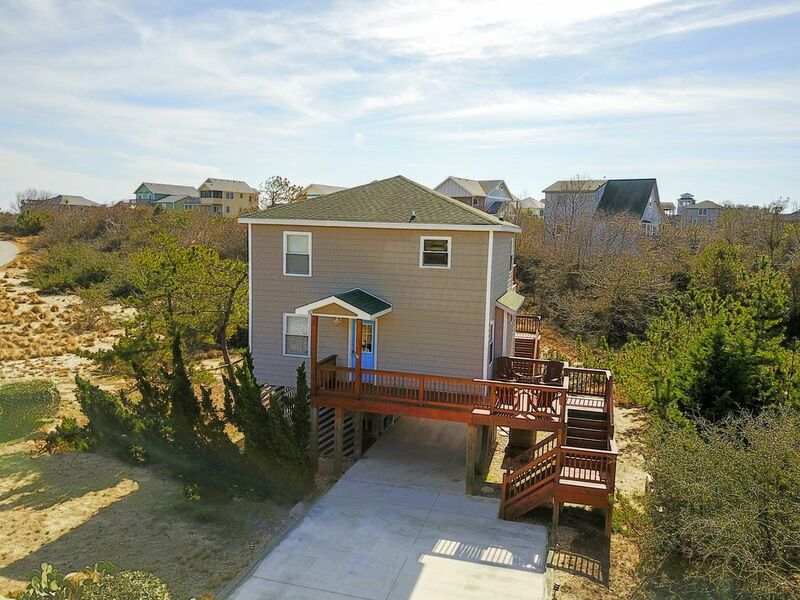 We are located in the community of Colony By the Sea which is within walking distance of the charming village of Duck and a short (less than 8 minute) walk through the dunes (on a private road) to the beach. Colony By the Sea offers amenities including a large seaside pool, tennis, basketball, etc. Here you'll find a well maintained, well equipped comfortable property that is ready for your beach vacation. 4 bedrooms (3 queen, 2 twin) and 2 baths are located on the first floor. Our home can sleep up to 8 . The great room, kitchen and dining room are located on the 2nd floor. The spa is located on a private deck on the ground floor along with an outdoor shower and recently remodeled laundry room. Wireless internet is also provided. Colony by the Sea is a wonderful family oriented beach community. We know you will be happy you’ve chosen our beach house for your vacation!! I am an Real Estate Agent in Katy, TX. I try my best to think of all the 'little' items that make a vacation the best, like supplying sand chairs, umbrella's, having a well appointed kitchen etc. The number of repeat guests has been awesome! They take care of the house as if it was there own. Year after year I am amazed as how wonderful these folks take care of our house. We love the Outer Banks (been vacationing here for 25 years), but Duck is the best location! Easy walk to the charming village with great shops and wonderful places to dine. If it's a movie or mini golf you want, it's just a short drive up the highway. Then head back home to the relaxing area and away from the craziness up the road! Beaches are uncrowded and clean. Duck is also a very family oriented spot. We call our home "My Happy Place". It feels like home not a house. We are located in one of Duck's most popular communities "Colony By The Sea". Private parking at the beach. No public access to the beach. Children can ride bikes, play tennis, playground and basketball courts. Our pictures are recent and we keep our home in excellent condition. From the back deck you can hear the ocean. We are about a 8 minute walk to the beach. We are the closest house to the beach on Sea Colony Drive. You can bike, ride or walk. We are located on the Oceanside. Our home is the closest to the beach. Private road with no public access. We are also walking distance to the Currituck Sound. Beautiful town of Duck. Excellent shopping and restaurants and Sound front boardwalk through town. You'll need to bring your own sheets, but we do have towels for our guests use. Please launder and put back before check out. We just recently remodeled our laundry room. 2016 we added a new concrete driveway. Plenty of parking. We do have towels, face wash cloths for each bathroom. You will need to bring your own paper products for the bathrooms. Living room is located on the upper level. Living room is very large and opens to the kitchen. Also we have a extra sitting area for reading or relaxing. New coffee maker 2017. We have a good supply of filters that our guest have left. Each year we have a new collection of spices! We have plenty of coffee filters. We do not provide any paper products for the home. You will need your own, TP, trash bags and paper towels. We have TV's in 3 bedrooms and large screen in the living room. All guest are welcome to use. You will find tons of books throughout our home. Beach buckets and shovels etc. located in our laundry room. Great Hot Tub on the main level of our home. Just about everything you need is a short walk into town. We love walking in the mornings to Duck Donut. They have the best donuts in the world. We love also going to The Cantina for Mexican Food, it over looks the Sound and Roadside Bar & Grill serves great sea food and other local favorites. Tons of restaurants and shopping.